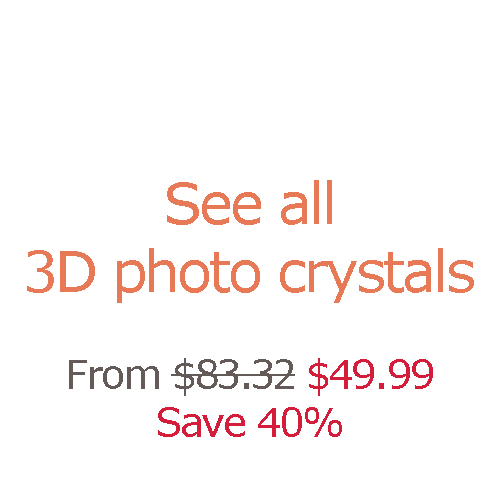 - From carefully polished 3D heart shaped crystal to XL 3D photo crystal cube, the 3d photo crystal lets unforgettable memories shine. 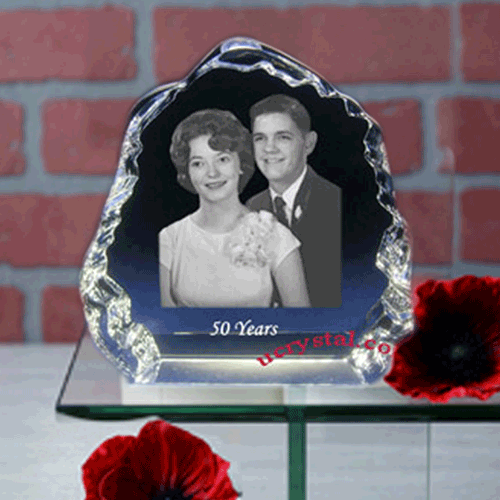 - Make your own beautiful personalized photo crystal that boasts your best moments. 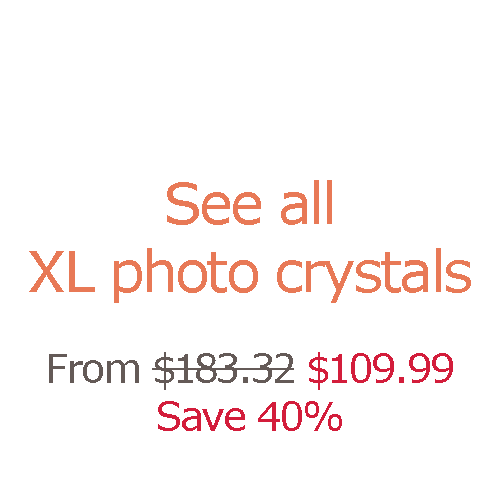 - Design a custom extra large photo crystal to preserve your favorite digital memories in a beautiful, long-lasting way. 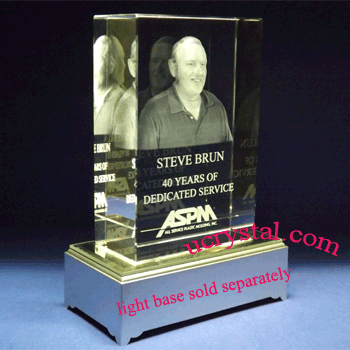 - We can laser engrave your company logo, employee photo INSIDE your crystal awards. - Our premier quality LED light base, which can be used around the world (100-240V), makes your 3D photo crystal shine! 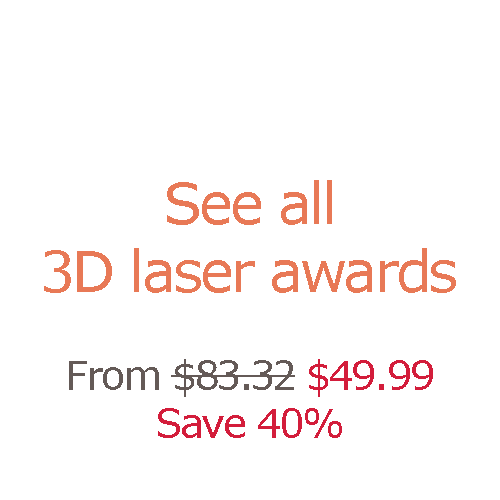 - Our 3D crystal awards always amaze our customers and make the recipients wonder how this could possibly be done! 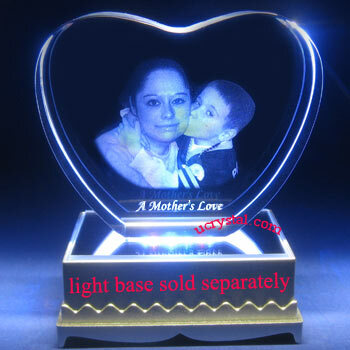 Laser photo crystal engraving fuses the art of photography with the advanced 3D laser crystal engraving technology. 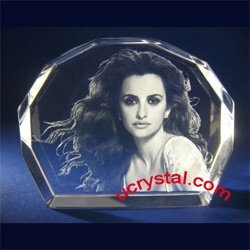 The results are images permanently etched inside the 2D or 3D photo crystals. 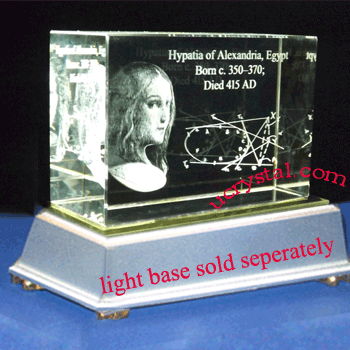 We have a large selection of high-quality, finely-polished 2D and 3D laser photo crystals with different shapes and various edge styles to further enhance the aesthetic effects of your 3D laser photo crystal engraving. 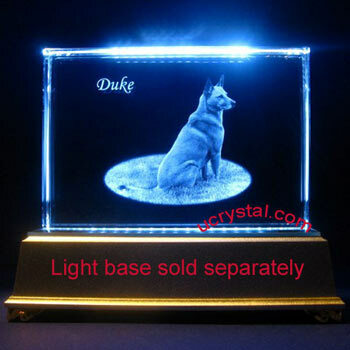 You can choose 3D photo crystals with or without firmly attached crystal base made of the same material. 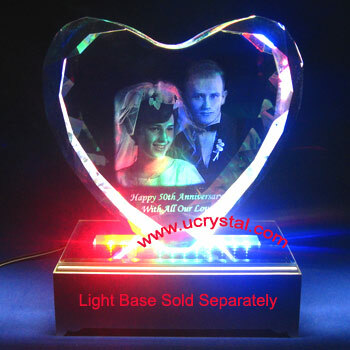 Additionally we have many standalone LED light stands and LED rotary light turntables that can be used underneath the engraved 3D photo crystals to add extra elegance to your treasured moment. 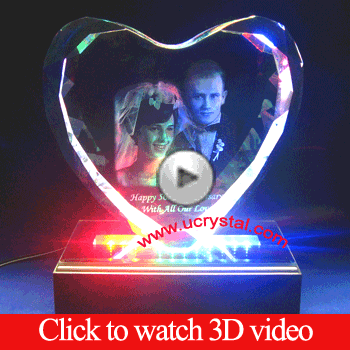 3D photo crystals - Our artists can convert a single portrait photo into a 3D photo for 3D photo crystal engraving. 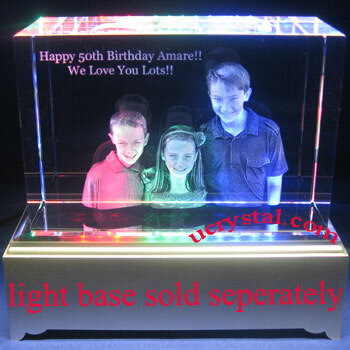 3D photo crystals can be viewed from the sides which makes the engraved images look more vivid and real. 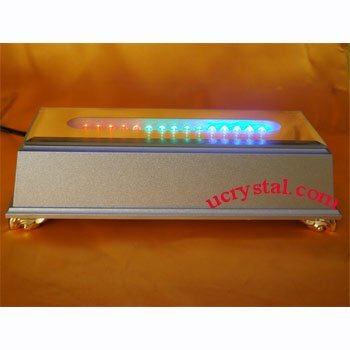 The videos on this page show you how a 3D laser crystal looks from different angles, and the difference between 3D photo crystal engraving and 2D photo crystal engraving. 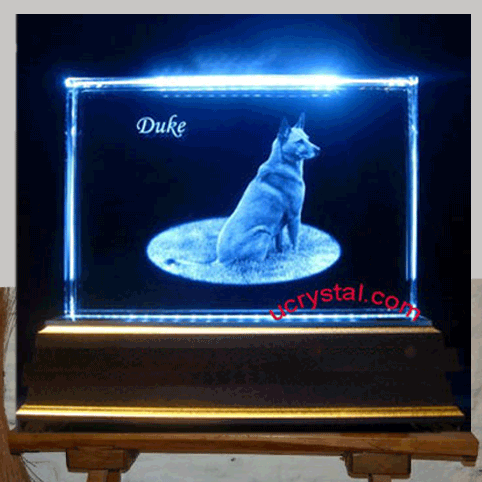 Personalized photo engraved crystal gifts - Commemorate a naïve childhood or a beloved pet with these personalized photo crystal gifts. 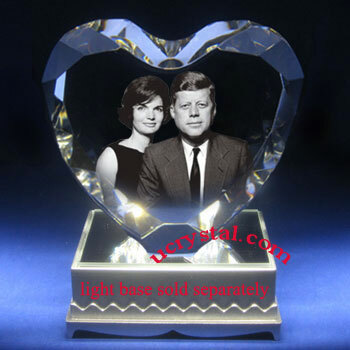 They are great custom photo crystal engraved gifts for birthdays, graduations, and wedding anniversaries. 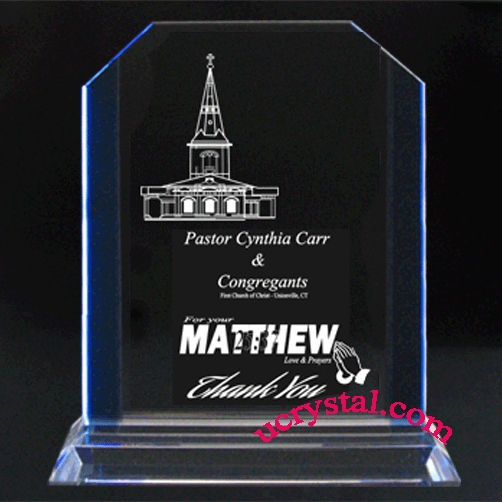 These personalized etched crystal gifts are also perfect for school graduation, retirement, Mother’s Day, Father’s Day and many other occasions. 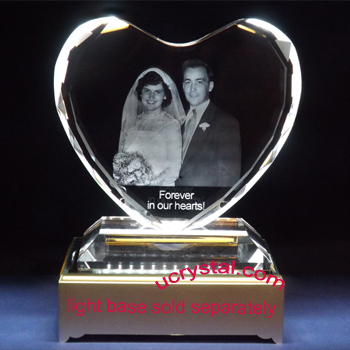 Laser etched extra large photo crystals - Celebrate weddings or anniversaries with these heart shaped laser photo crystals. 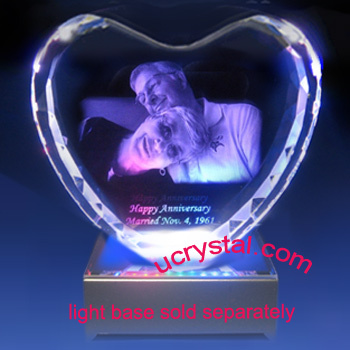 They are especially crafted as engraved photo crystal wedding gifts, anniversary crystal gifts or Valentine's Day gifts. 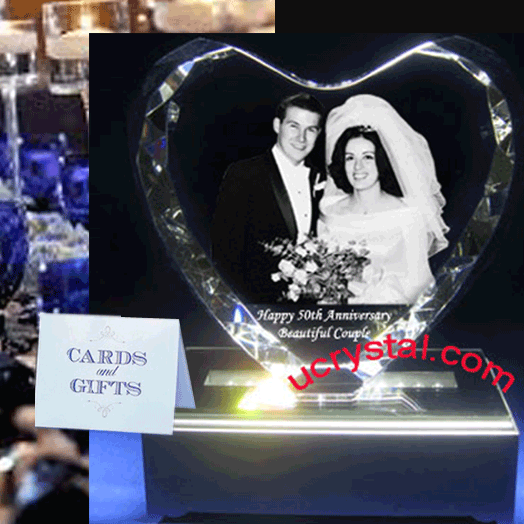 Your wedding photos or special moments will be custom etched and permanently preserved inside these beautiful extra large photo crystals. 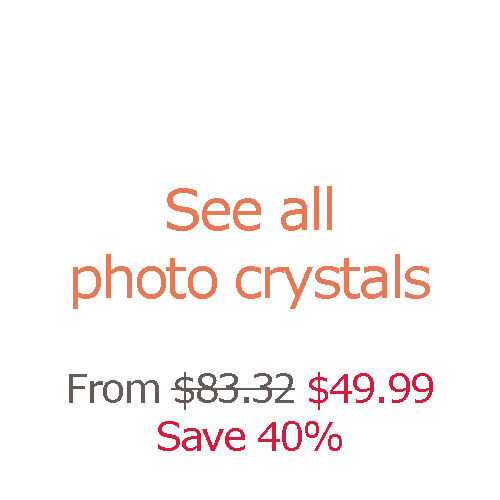 These photo crystals are suitable for both individual portraits and group photos. 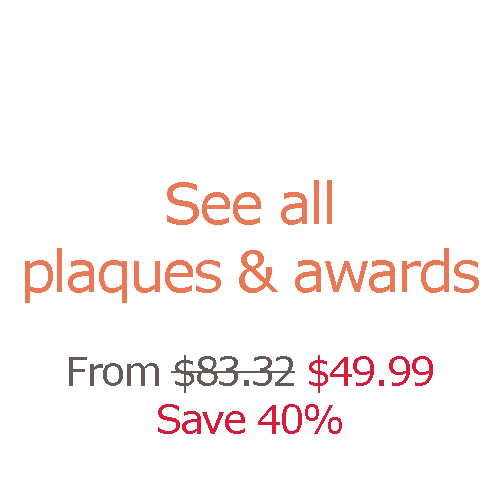 Custom engraved corporate recognition crystal awards and plaques - Laser etched 2D or 3D crystals are excellent for use as custom engraved crystal awards and corporate engraved crystal plaques. 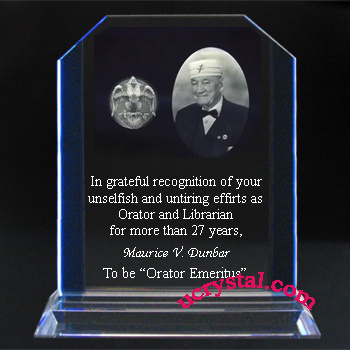 Companies and organization use them for corporate employee recognition crystal awards, custom corporate crystal gifts, and executive achievement awards. Many customers also use them as employee retirement souvenirs, intellectual property certificates, and supplier quality awards. 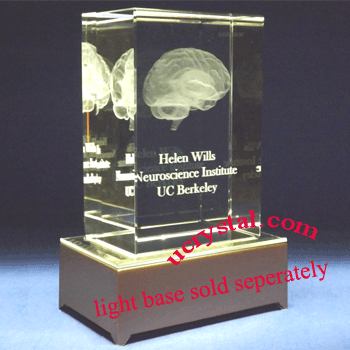 We can laser engrave your company logo, photo inside your crystal awards. 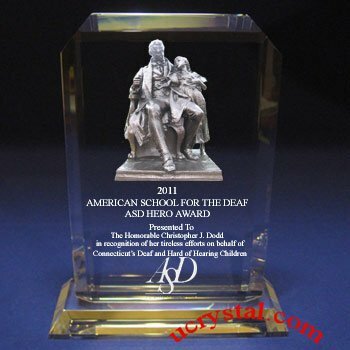 We have proudly served many top US companies and organizations with custom engraved crystal plaques and awards. We would like to have the privilege of adding your organization to the long list of satisfying customers. 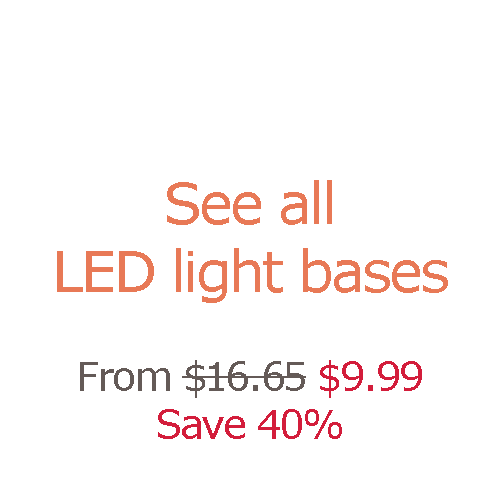 LED light bases for crystals, glass art - We have many LED light bases and light stands to enhance the visual effects of your 2D or 3D engraved photo crystals, glass sculptures, glass arts, or Swarovski crystal figurines. 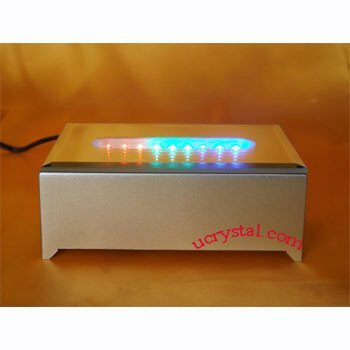 These light display stands (also referred to as rotary light bases, crystal light stands, or lighted bases) make the laser etched crystals more eye-catching and futuristic. 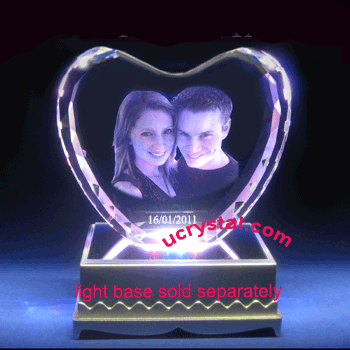 The LED light stands have a flat top surface on which engraved photo crystals or crystal figurines can be placed on. 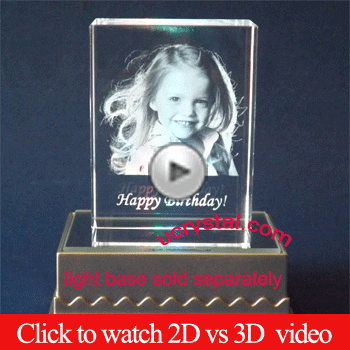 Please take a look at how we turned plain photos into elegant 3D images inside the etched 3D laser crystals using advanced laser 3D photo crystal engraving technology. Your cherished memories will be preserved for a long time to come! We are located in San Jose, California, in the heart of the Silicon Valley and the San Francisco Bay Area. We are privileged to be at the high-tech epicenter and honored to provide highest quality service to customers all over the world.